Take a close look for these common threats in your backyard, then take the appropriate steps to fix them! Outdoor pets – both cats and dogs – can be a grave threat to backyard birds. Not only may pets hunt or stalk birds, but they can disrupt nests, dig up habitat, damage feeders and generally make birds feel unwelcome. Keep Birds Safe – Supervise pets outdoors at all times to be sure they are not harassing birds, or use enclosed kennels, runs or catios to give pets time outdoors without providing access to birds. All backyard birders want great views of the birds, but wide, clean, unobstructed windows can be fatal to birds that collide with the glass. Even if the bird just seems dazed, it may succumb to internal injuries or be more vulnerable to predators while it is disoriented. Keep Birds Safe – Position feeders either more than 10 feet away from windows or closer than 3 feet to windows to lessen collisions, and take steps to make the glass more visible to birds, such as applying decals or ribbons birds can easily see and avoid. Any significant concentration of chemicals, including pesticides, herbicides, fertilizers and other common lawn and garden additives, can be dangerous to birds. Even if the chemicals are not a direct threat, they may destroy plants or insects birds use as food. Keep Birds Safe – Minimize chemicals in the yard, and encourage birds to be natural weed and insect control instead. 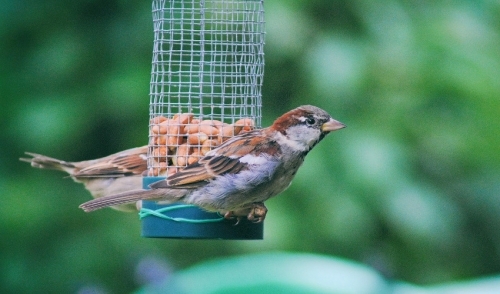 If chemicals must be used, be sure they do not contaminate bird feeders or baths. Moldy seed, rancid suet and fermenting nectar can all be dangerous to birds. Spoiled food harbors mold, fungus and bacteria that can transmit diseases to an entire backyard flock. Contamination can also come from dirty feeders when a buildup of old seed hulls, feces and other debris mixes with fresh food. Keep Birds Safe – Always discard bird food as soon as it begins to spoil, and never mix fresh food with old supplies. Store seed and other foods properly to stay fresh longer, and take steps to keep seed dry. Feeders should be thoroughly cleaned regularly. Scummy water in the bird bath may not be appealing, but birds will visit it if they have no other choice. Water that is contaminated with feces, decaying plant material, algae, insects or yard chemicals can be highly toxic to birds and diseases can easily be transmitted through dirty water. Keep Birds Safe – Clean baths regularly and use a weak bleach solution to thoroughly decontaminate the basin with each cleaning. Also clean the bath's rim and any popular perches nearby, but never add chemicals to the water to try and keep it clean. It can be exciting to see a bird family take up residence in a backyard house, but it is devastating when that house is raided by a predator, overrun with insects or the family dies for mysterious reasons. Keep Birds Safe – Be sure bird houses are appropriately sized for each family, and use predator guards and baffles to keep them safe. Drill ventilation and drainage holes in the house if necessary, and clean houses after each nesting season to eliminate insects and bacteria. Even beautiful plants can be a problem if they take over garden and flowerbed space, crowding out other plants that birds would have used for food, shelter or nesting sites. Birds do not often recognize invasive plants as useful, no matter how lovely they may be in the garden. Keep Birds Safe – Opt for native plants adapted to your region and climate whenever possible, and either remove invasive plants entirely or take careful steps to be sure they stay under firm control in the yard. All wildlife isn't always welcome in the backyard, but traps for mice, rats, raccoons and other unwanted guests can also trap and injure or kill birds. Snap traps can crush birds, while glue traps will pull out or coat their feathers causing grave injuries or death. Keep Birds Safe – Choose humane pest control methods as much as possible, and always keep all traps well out of birds' reach. If necessary, stop feeding the birds and remove bird baths when traps are in use to minimize the risk to visiting birds. It may seem like a good idea to use a fine mesh net to cover delicate garden plants and protect them from birds and other wildlife, but birds' feet and wings can quickly get tangled in the netting, causing injuries or strangulation. Keep Birds Safe – Use alternative methods to keep birds out of a garden if needed, or opt for highly visible netting designs that birds will be able to avoid more easily. It is wonderful to have kids exploring nature and getting to know the backyard and garden, but wild birds will see even the most innocent curiosity as a potential predator and threat. Just like outdoor pets, children can scare birds away, and picking up or handling a bird could cause serious injuries. Keep Birds Safe – Teach children to respect wildlife and enjoy it from a safe distance. Get kids involved with birding by teaching them what birds need and finding ways to help them be active with birds, such as making pine cone bird feeders or having their own bird bath to tend. Even the most well-meaning backyard can have some threats to wild birds, but by recognizing these common threats, it is easy to take steps to lower the risks birds face and enjoy every feathered friend that visits.